As a business leader, what keeps you up at night? What is causing you to feel pain? Some of the most significant leadership pains business leaders suffer from include: the shortfall in achieving desired results, lack of an inspired high-performing executive team, the lack of an engaged workforce, the inability to attract and retain quality talent, the lack of leadership skills in managers, and the lack of a values-based culture that enables bad business decisions and unethical behaviors. There is a certain DNA of the army in creating brave leaders: competent and confident in their ability to lead. Based on this DNA, I became inspired to develop my own model called BRAVE that incorporates proven best practices from my experience in the army that can be immediately applied to the business world. This model is the subject of my upcoming book, with each letter representing a key element of the methodology. 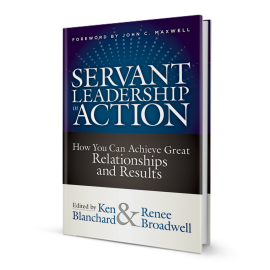 When applied, it can help grow leaders, grow the people being led, and ultimately produce greater results for the business. Would it be beneficial to have a simple, yet powerful, proven model to help guide your development as a leader, and in turn help you develop your people? If so, I invite you to read on. Character is at the heart of being an effective leader. It represents who you are and what you stand for. No amount of leadership or technical competency can overcome a lack of character. It begins with a comprehensive understanding of yourself—a necessary condition before you can effectively lead others. Character is ultimately defined by those values or deep beliefs that guide behavior. For leaders to be followed, they must secure the trust and confidence of their followers. The best leaders of character define their own values and embrace the core values of their organization. The communicate those values, then bring them to life through living them, and reward others who live them. 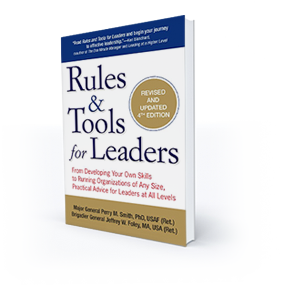 Uncover those critical leader skills for you and those throughout the organization. Bring them to life. Core leadership skills highlight the fundamentals of solid leadership for every leader in the organization. Additional skills become important as one progresses up in the organization because responsibilities and authorities change. For instance, at the executive level, the environment is characterized by increased complexity, higher risk, greater uncertainty, and less direct control over subordinate echelons. After the critical leader skills are identified, perform a comprehensive assessment of proficiency in these skills for you and the other leaders. There is risk to any organization if expectations of proficiency in the critical leadership skills are left up to chance. Since 1775, the army recognized the value in investing heavily in the development of leaders at all ranks. Good development programs help prepare the current and future leaders to be prepared to lead teams and set the conditions for the organization’s future success. Once developed, rigorous execution of the program is paramount. The best leaders recognize the importance of sustained investment in the development of their people. Success stems from a culture where leaders are equipped with the mindset and passion for developing others. Leaders own the task of developing their people and cannot ignore it. One-on-one coaching is arguably the most important skill a leader must possess to be effective in developing others. The best leaders are great communicators who set the example for what right looks like. Great coaching skills do not come naturally to many leaders; they must be learned and practiced. When leaders ignore or short-change this critical task, their people fail to grow and reach their full potential. The consequences continue to expose themselves as their people will also fail to learn how to coach their own subordinates. The entire organization suffers. The keys to coaching success include creating a positive and open communication environment, agreeing of clear goals, and engaging in consistent dialog focused on assessment of performance and inspiring actions for the future. Trusted relationships between leaders and their people trump everything when it comes to effective leadership. Being successful in life is a team sport. A leader’s influence over others will not occur if their mutual trust is absent. For leaders to be trusted, they need to be leaders of character, competent in technical and leadership skills, genuinely care for their people, and exercise humility. The best leaders have these qualities. Trusted relationships remain in place for life. Soldiers will follow their leaders into the most dangerous places, under the most extraordinary conditions if they trust their leaders. Earning that trust is a critical task and must be mastered to be a leader in the army. Why BRAVE? Francis Scott Key is the author of the famous words “The land of the free and the home of the brave.” He wrote those words in 1814, and since 1931, they have been sung as the national anthem of the United States. The word BRAVE has powerful meanings. Being a great leader is tough business. It takes courage. It takes bravery. There are powerful lessons to be learned from the US Army. I wish you the best in your leadership journey.